Our bodies are remarkably good at protecting us from harmful substances, but every now and then a microscopic organism sneaks in that can make you sick. The immune system is a collaboration of bodily functions that requires a delicate balance. While it can be difficult to pinpoint how to shield ourselves from sickness in every way, the tips below are meant to show you the importance of preventative medicine and what to do if the microorganism wins. The single most important thing you can do to boost your immune system is to live a healthy lifestyle on a regular basis. Don’t smoke. Make sure to eat a healthy diet, exercise regularly, maintain a healthy weight, get adequate sleep, moderate your alcohol consumption and keep stress levels in check. Hand washing: This is the number one way to prevent germs from spreading. Effective hand washing includes rubbing the entire hand for more than 20 seconds or using an alcohol based hand sanitizer. Exercise: Regular exercise (not during sickness) is the cornerstone of healthy living. Exercise improves circulation by mobilizing immune cells through the body so they can do their job. Rest: If you are sick, stay home & take care of yourself! Steaming: Moist air helps decrease a stuffy nose and improve breathing. Try a hot shower or add a few drops of eucalyptus or peppermint essential oil to a ceramic bowl of hot water, place a towel over your head and breathe in deeply. Reduce Stress: Stress, whether it be from work, social activity, depression, or a hectic schedule, can lower the immune system. When we are stressed we often forget to care for ourselves. Ayurvedic Self Massage: Helps reduce internal stressors, improves immune function, and revitalizes the body. Massaging herbal oils into the skin lubricates the internal environment, loosens up stored toxins and carries them back to the digestive tract for elimination. Power of Positivity: Research has shown, mindful meditation practiced in a work environment with healthy employees increased antibody titers to the influenza vaccine. This suggests meditation and reflection may change brain and immune function in positive ways. Cider Vinegar: Use with honey, well diluted. Flushes the body of toxins and shorten the duration of sickness. Epsom Salt (Magnesium–Sulfate): Two-thirds of us are magnesium deficient. Correction leads to improved electrolyte function, circulation, flushing of toxins, and stress reduction. Magnesium reduces inflammation, relieves muscle pain and can ease migraines. Pour 2 cups into warm bath water and relax for 30 minutes. Garlic: Some types have antibiotic properties and infection-fighting capabilities. Researchers have seen garlic work against bacteria, viruses and fungi. Although promising, there aren’t any well-designed studies translating to human benefit yet. Ginger: For fever, nausea, dizziness and headaches associated with flu symptoms, fresh ginger root can be grated up as a tea or added to soup. Hard ginger candies are soothing for sore throats and prevent nausea. 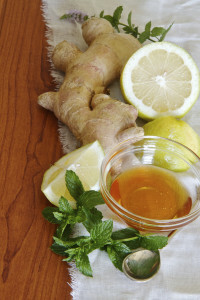 Ginger is spicy and should be consumed in small amounts if you have acid-reflux. Since ginger and aspirin are both blood thinners, remedies should be taken 2 hours before or after aspirin. Echinacea: Helpful for the acute symptoms of colds and the flu, especially when taken early in an illness. It stimulates the immune system and is safe for children. Echinacea can also be used during lactation. Avoid taking if you have ragweed sensitivity. It should not be used long term. Elderberry: Has anti-viral properties and tastes great. Sipping a tincture or syrup at the first sign of symptoms can prevent a cold or flu virus from spreading into a full blown illness. Honey: A fantastic soothing choice for sore throats and cough. Add to herbal teas or dilute a teaspoonful in warm water. Do not give to children under 1 year. Immune Boosting IV Therapy: The strongest, most popular IV therapy is the “Meyer’s Cocktail.” This combination of nutrients is used to prevent and treat conditions including the flu, allergies, and upper respiratory infections. Oscillium: A homeopathic flu remedy that temporarily relieves acute symptoms (feeling run down, headache, body aches, chills etc.) It can be used regularly throughout cold and flu season for preventative measures. Thyme: An herbal remedy for sore throats. Make a tea with a teaspoon of dried thyme and honey for soothing, sore throat relief. Saline Nasal Sprays: Can help to thin the nasal mucosa secretions and flush sinuses. Salt water gargles: Useful for sore throats and will help decrease inflammation. Vitamin C: 500 mg daily intake can boost immunity and help prevent the common cold. Vitamin C works with other micronutrients rather than providing benefits alone. Vitamin B6: Studies have suggested vitamin B6 deficiency can depress aspects of immune response. Supplementing with moderate doses restores immune function. Mega doses do not produce additional benefits and should be avoided. Wild Cherry Cough Syrup: A delicious, effective and tasty choice for coughs. Great for kids with coughs. Can be purchased at WLHC. Zinc: Zinc deficiency affects the ability of immune cells to function as they should. While it’s important to have sufficient zinc in your diet (15–25 mg per day), too much can inhibit function. PLEASE AVOID: Do not combine over the counter products as they may contain the same active ingredients (i.e. Sudafed, Dayquil, Nyquil, Dimetapp, Robitussin). These medications can be helpful for acute symptoms, not long-term relief. The ingredient pseudoephedrine can be overly stimulating and actually worsen symptoms. Additionally many of these products contain artificial ingredients. Remember the saying “you are what you eat”? Well that holds true, especially for the immune system. In order for your cells to effectively battle an active infection you need to make sure they are properly nourished. If you suspect your diet is not providing you with all your micronutrient needs, a daily multivitamin may be the answer. Taking mega doses of a single vitamin is not going to help you. More is not necessarily better. Increase Fluids: Stay hydrated with water, herbal teas and juice. Fluids, especially water, help to lower fevers, thins mucus, and helps carry toxins and waste out of the body. Staying hydrated is even more challenging when you are sick. Stay ahead of the game and drink even when you aren’t thirsty to prevent dehydration. Protein: Illness remedies are futile without adequate protein. Protein fuels us and gives us energy to heal. Diets deficient in protein have shown lower levels of T-cells and macrophages (both immune fighting cells). Hot and Sour Soup: To help mobilize secretions add cayenne pepper, ginger root and garlic to chicken soup. Also see our “Immunity Soup Recipe” below. Warm it up: Drinking hot water throughout the day is an effective way to remove toxins from your system and hasten recovery from a cold. Eliminate all cold water and cold food or beverage from your diet. Sauté: Onions, Garlic, Julienned Sweet Potatoes, Carrots, Broccoli, and Shitake Mushrooms in 1 T of Canola Oil and 1T of Sesame oil in a pan. Add Curry Power and a dash of Cayenne Pepper and Simmer. (You May Add A Butternut Squash Soup Base, Chicken, Chickpeas, or White Beans as desired). Cook on Low and Serve Hot. Enjoy!